Panasonic has enlisted proprietary audio science to help it standout in the increasingly crowded soundbar market. Not only can the main speaker in this 2.1 system transform into stereo bookshelf enclosures (should you prefer), it comes with a separate processor which handles amplification and DSP. 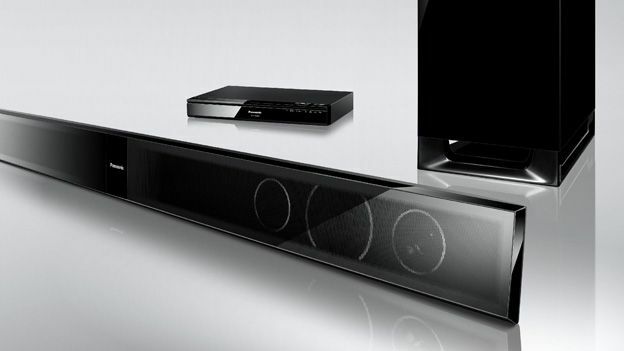 The Panasonic SC-HTB550's nearest high street rival is the Samsung HW-E551, another 2.1 system built around a multi-functional soundbar, but it'll also likely compete against more conventional 5.1 fare, such as the LG BH7420p. The SC-HTB550 embraces the Stelios approach to home cinema. Supremely easy to set up, it can be used with HDMI and digital optical audio sources and is Bluetooth compatible, allowing wireless partnerships with mobile devices. It ships with a basic credit-card style remote which handles input selection along with level and bass control. Let's face it, the SC-HTB550 is a system best suited for a very dark room. While fetishists may dig its shiny black plastic façade, build quality is average. The subwoofer is a lightweight affair, weighing just 5.2kg, while the soundbar is flat-faced with a non-removable grille. At 956mm it's probably a tad too small for 50-inch screens. There's no LED display on the processor unit, just some unhelpful blinking lights. The processor offers dual HDMI inputs (one of which is ARC compatible), and two optical digital audio inputs for source hook-up. There's also a single HDMI output. Colour coded cabling is provided to simplify setup. What this system lacks in designer flair, it certainly makes up for in home cinema theatrics. It creates a big noise, with Panasonic's proprietary 3D processing invoking a convincing surround illusion. In default mode, Panasonic 3D sound processing is applied to all multichannel sources. A tear down reveals this to be a Dolby Virtual surround algorithm overlaid with some in-house soundfield processing that gives additional width and height. You can switch it off if you like, but as it's so effective there's little point. Despite the physical constraints of the soundbar, sound steerage is excellent. The SC-HTB550 boasts a power output of 60w (into 6ohms), while the sub thumps out mid-bass at 120w (into 8ohms) at full pelt. A symphony in black plastic, the Panasonic SC-HTB550 confounds expectations. The system, which comprises a wireless subwoofer, 95cm soundbar and dedicated audio processor, looks decidedly utilitarian – yet it sounds like a mini multiplex. Two HDMI inputs mean you can hook up both games console/disc player plus a set top box, and system is Bluetooth compatible too. Movie soundtracks are delivered with authority and the system's virtual 3D sound processing does a terrific job spreading audio far and wide. While we wouldn't rate it as a hi-fi solution, it's well worth an audition if you want home cinema sound without the hassle of multiple speakers.